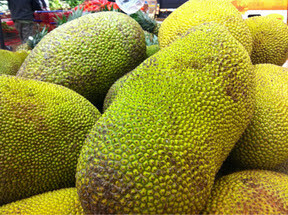 Fresh whole jackfruit at Viet Hoa, Houston, TX. How this managed to get imported is a marvel of modern transportation technology. But I wonder who buys a whole fruit at a time? To balance out the recent discussion of micro citrus, how about we talk about something big. I mean really big. The nangka or jackfruit is the largest tree borne fruit in the world. These things are massive, weighing in as much as 80 lbs, and despite being a tropical fruit, is now readily available in fresh form here in the Houston area. That means that the versatility of the fruit, being cooked as a vegetable in the unripe form, can be showcased in local dishes. The seeds can also be roasted, and served up like nuts. But, in a pinch, the ripe flesh around the seeds are peeled off, and can be easily purchased canned in syrup. A can of jackfruit, and a can of coconut milk made for some very flavorful ice cream recently. 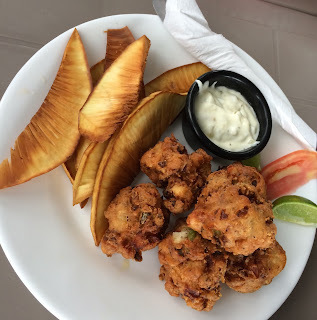 The tricky thing about jackfruit is that it is very stringy. To prepare it properly, one should cut across the strings to make them manageable. Cut across the strings of the jackfruit into thin slices, and process into a fine puree in a food processor. Heat up coconut milk and milk in a pot. Mix the sugar and the egg yolks until smooth - should really dissolve the sugar. Temper the eggs with the hot milk mixture, and return to the pot, cooking into a custard much like a sauce Anglaise. Stir in the jackfruit puree, mix until smooth, and sit the pot in some ice water until chilled. Process in an ice cream machine. Serve in small scoops with gingerbread. Labels: coconut, fruit, ice cream, jackfruit, recipe.